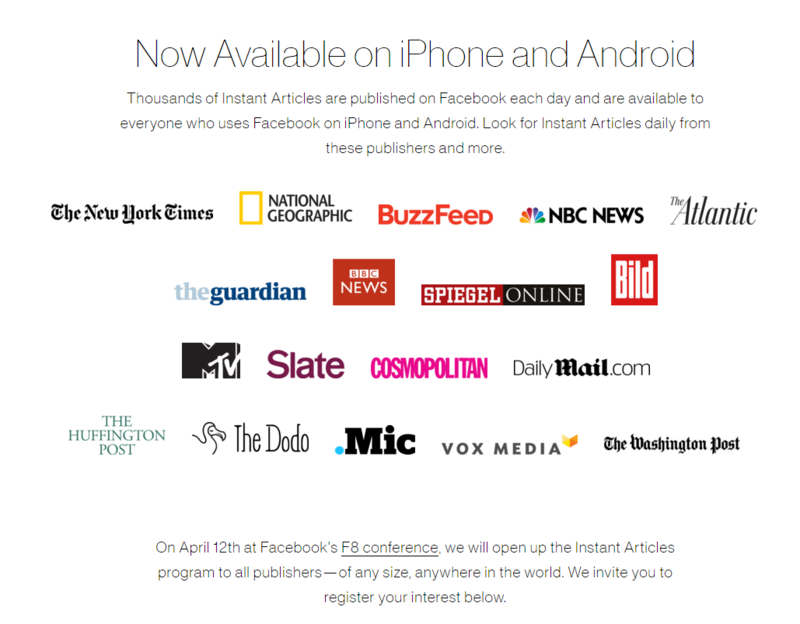 April 12 Facebook Launches “Instant Articles” – Will this be a game changer? Posted March 24th, 2016 by AdminGURU & filed under SEO. Fast and Responsive Leveraging the same technology used to display photos and videos quickly in the Facebook app, articles load instantly, as much as 10 times faster than the standard mobile web. Described as a significantly faster method for distributing content primarily for mobile consumption, the “Instant Articles” framework is similar to AMP by Google, but with more customization options including the ability to zoom into images and autoplay video. What does this mean for SEO. Well, it depends on how you look at SEO. Search Engine Optimization is preparing content to be easily and properly consumed and served by search engines. Initially AMP would be the choice for SEO agencies, since it addresses exactly this. Instant Articles is similar in what it accomplishes (in the sense of speed) however since Facebook is actually a walled garden of data (require login to access most features and functions) it sits on the fence between social network marketing and SEO. Social Signals make up a large part of the search engine scores according to Microsoft (BING) and Google, and has additional potential for driving traffic, there are different methods to best leverage each of the new technologies. How can you start to take advantage of these technologies? Well, unless you are a large marketing group or professional publisher, chances are you will need to wait until the April 12 launch date like everyone else, however in the meantime, you should start checking out how you can pre-configure your website to take advantage of each of these technologies. For those who run custom websites designed by hand you will want to take a look at the developer sections for Facebook and Google. For those who use WordPress, take a look at PageFrog. This little gem of a plugin makes it easy to incorporate each of the new markup to your existing articles, pages and posts. What are Facebook Instant Articles and Google Accelerated Mobile Pages? FBIA is a new mobile format developed by Facebook, which can be served to visitors accessing your content from the Facebook mobile app. AMP is a new mobile format developed by Google, which can be served to visitors accessing your content from Google, Twitter, LinkedIn, and Pinterest mobile apps. Why should I optimize my content for FBIA and AMP? The FBIA and AMP formats are built to load instantly on mobile devices and designed for higher engagements, resulting in improved News Feed Ranking and greatly benefits Search Engine Optimization. Increase traffic and discoverability – Search engine optimization and social media discovery are extremely important when it comes to generating traffic. Both Facebook Newsfeed Ranking and Google PageRank rely on performance metrics such as page load times and visitor engagements to rank articles. Native mobile formats such as FBIA and AMP offer unprecedented advantages when it comes to page performance. These mobile formats preload content and cache media files, allowing articles to load instantly for readers on mobile devices. Boost engagements and shares – FBIA and AMP offer opportunities for true mobile experiences to captivate and engage readers. These formats allow for a number of advanced features specifically designed for mobile content such as audio captions, interactive maps, tilt-to-pan photos, and more. These formats are deeply embedded into mainstream mobile apps such as Facebook, Twitter, LinkedIn, and Pinterest. FBIA and AMP offer specific layouts designed to maximize social engagements such as Likes and Comments. Who is using these technologies already? are native mobile formats created to help publishers evolve into the mobile economy. Instant Articles and AMP Pages are designed to deliver the best mobile reading experience, which leads to an increase of traffic. Native mobile content receive significantly higher engagements and are much more likely to be shared across social networks. Native mobile content load directly within mobile apps such as Facebook and Twitter rather than through mobile browsers. Instant load times, smoother scrolling, and enhanced legibility are combined to produce the perfect reading experience. Deploy interactive elements built specifically for mobile, such as tilt-to-explore photos and embedded audio captions. The average article takes on average 8 seconds to load. Native mobile formats load up to 10x faster than standard links. What can I do with the PageFrog plugin? Content Optimization – Rather than following FBIA and AMP documentations to build custom layouts from scratch, PageFrog automatically takes your existing content and optimizes the page structure to fit the requirements of FBIA and AMP. Quality Assurance – PageFrog offers real-time previews of how your content will appear on FBIA and AMP. This allows you to write content and see the output as you’re writing, ensuring that your content will always appear professionally on FBIA and AMP. Branding and Styling – FBIA and AMP enforce their own unique styling restrictions. Rather than building custom layouts for each format, PageFrog allows you to handle all your branding and styling needs within the WordPress interface. Analytics and Insights – PageFrog allows you to connect multiple third party analytics to your FBIA and AMP pages using Google Analytics, Chartbeat, Parse.ly, and more. PageFrog can also display your analytics data from Facebook Insights directly within WordPress. Ads and Monetization – PageFrog makes it extremely easy to monetize your content through FBIA and AMP. Simply connect your Facebook Audience Network and/or Google AdSense account to start displaying ads with full control over ad placement and display frequency. 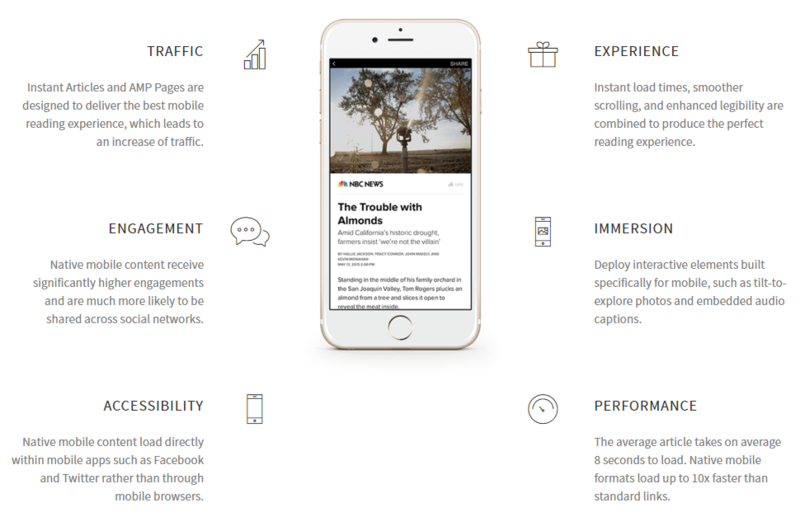 Rather than studying the documentations and building custom layouts from scratch, PageFrog offers simple plugins designed to help publishers instantly and easily publish content to mobile formats such as Facebook Instant Articles and Google AMP Pages with the simple click of a button. PageFrog plugins offer live previews directly within content management systems, allowing publishers to ensure that articles will display appropriately across various platforms. Intelligent notifications and warnings are also delivered whenever published posts contain certain elements leading to suboptimal mobile display.